Who is going to win the Big East this year? Your guess is as good as ours, but assorted BE football bloggers decided select a consensus conference favorite, also voting for all-conference teams, and projected award winners in the process. If your favorite blog was not included, it was either because they apparently have no fans on the internet (Cincinnati), did not respond to invitations to participate, no contact address could be found, were unfortunately overlooked, and there was one major human oversight where a ballot was not sent in time to the popular Pitt Blather blog. 1. USF (3) - Big East bloggers generally loved USF, with the only major skeptic being Rutgers blog Bleed Scarlet. 2. West Virginia (2) - The votes are once again a near consensus, with Syracuse blog Troy Nunes Is an Absolute Magician the only one skeptical of the Mountaineers. 3. 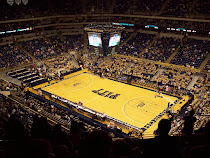 Pittsburgh (1) - Aptly named The UConn blog projects big things for the Panthers in '09, losing only one conference game. 4. Rutgers (1) - The double reverse jinx may be in play, with Troy Nunes Is an Absolute Magician seeing the Knights rolling through a god-awful schedule to their first ever BCS berth. 5. 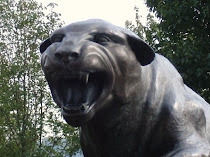 Cincinnati (1) - There's a lot of skepticism of the Bearcats this year, likely owing to their complete overhaul on defense. Bleed Scarlet thinks that Brian Kelly and co. will manage to outscore their opponents anyway, while Syracuse blog The Orange Fizz believes that Cincy will barely manage to stay out of the conference basement. 6. UConn - UConn's projection is as boring and monotonous as their offense, with exactly four voters placing them fifth, and the other half had them sixth. 7. Syracuse - Upset of the century! The rebuilding Orange managed to stave off a crumbling Cardinals squad for seventh. The Orange Fizz actually has the Cuse finishing sixth in conference, ahead of Cincinnati. 8. Louisville - It's going to be a very long year for the once-proud Cardinals. Bill Stull an honorable mention? What does that say about the conference? I cannot take credit for voting for Bill Stull. As a Panther fan, I've seen him up close. Anthony Davis and George Selvie not unanimous selections? Yeah, like this poll has any credibility. Hi! I'm the one who didn't vote for Selvie. I think he's one of the most overrated players in the country.